With Christmas on the way I thought I'd create T another one of my Boo bags a story bag where I fill a plain bag with a book and some linked activities. I'm working on a series of these bags for 2016, so if you have any ideas for great books I could use, I'd love some recommendations please! Sometimes there may be more than one thing to do and learn and sometimes there might be something a little extra in there too! For this bag I've stuck to the 4 elements. 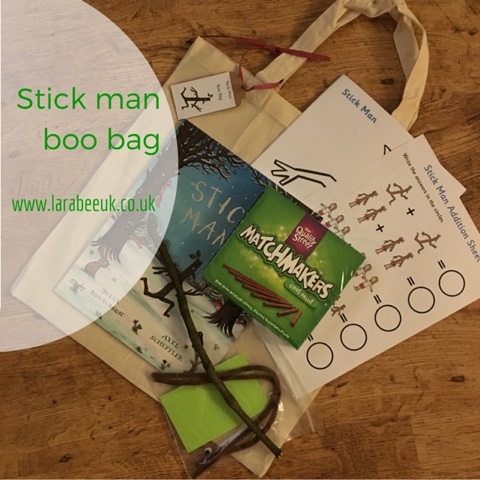 I decided to use Stick Man as my book of choice as its a book we haven't got but I know T likes, this bag will be his first advent book, so he'll get this to do on 1 December, which is why my photos are a little limited! For my 'something to learn' I turned to the fantastic Twinkl resources website where I found an abundance of printables. I used the addition sheets and some colouring sheets but there are loads to choose from if you wanted to here's the link, some may need a subscription to download. 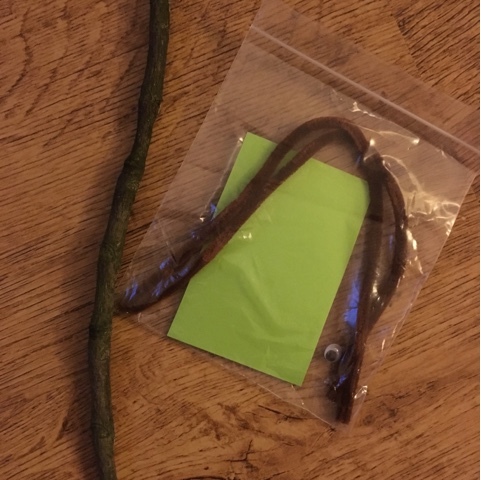 Something to make is an actual stick man, I've included a stick, some pipe cleaner limbs, some googly eyes and some green paper to cut out some leaves. 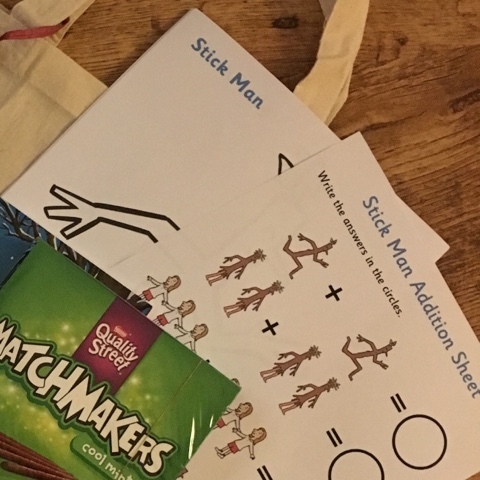 Once we've made our stick man I'll update with some photos! For 'something to eat' I thought matchmakers would be apt as they look like twigs so we can chomp on those whilst reading the book. I love putting these little bags together for T and I love his face when he opens one, it's like having a little gift each time. The other boo bags I've made are The snowman boo bag and Polar express boo bag. Please do hit me with some great book recommendations, I'm absolutely loving the ones I'm planning so far, like Paddington and What the ladybird heard next. I love book bags, such a great way to extend the love of books and further the learning. Hope T enjoys this.